Country music stars Brad Paisley and Carrie Underwood co-hosted the 51st annual CMA Awards. A week before the awards ceremony, the CMA sent out media guidelines telling reporters not to focus on gun rights, political affiliations or the Las Vegas tragedy, where 58 people were killed at the Route 91 Harvest music festival. Paisley and others spoke out about the restrictions and they were reversed, but it brought into focus the relationship between the country music industry and the debate about guns in the U.S.
Music journalist Jonathan Bernstein has written about this and joined All Things Considered host Kelly McEvers to talk about how those in the industry view guns, and why the Country Music Association took the actions it did. I think the Country Music Association was very worried that politics, or what they view as politics — or sort of debates about guns, about the NRA, about sort of what happened in Las Vegas — would take the center stage on sort of what is generally considered to be the most important night of country music. While there are certainly, there are mainstream country stars who are deeply conservative and there are mainstream country stars who fall much more closely in line with liberal and progressive ideas, I think for the most part, you find with big entertainers at this point in country music, that the situation feels as though if you make one sort of strong statement, in one way or the other really, you're risking alienating just a really large portion of your fan base. ... If you talk to people in the country music industry about any topic relating to the intersection between politics and country music, the first name that you'll hear is the Dixie Chicks. I would imagine there are these sort of whisper networks in country music of sort of, who are the secret progressives and who are the secret Democrats and liberals? And Tim McGraw and Faith Hill haven't been super-secretive about their politics in the past. They donated money to Hillary Clinton's campaign. And even on the issue of gun control, Tim McGraw, couple years ago, he had agreed to play a benefit concert after the Sandy Hook shooting, with this organization that was associated with gun control. And he received a lot of blowback from that. Tim McGraw and Faith Hill are two of the most successful and most beloved country entertainers of the past 20 years, and they have a whole lot of money and a whole of fans that are devoted to them at this point. So I think that it is easier for them to do it, than say someone who is to any degree less proven, which is almost everybody in country music. I don't expect there to suddenly be some huge wave of country artists that are coming out and getting really involved. But I think that people are continuing to, at the very least, have this conversation with themselves. And I think that it's going to continue to be an issue on the minds of everybody in the industry for a long time. Christina Cala produced the audio version of this story. Wynne Davis adapted it for web. 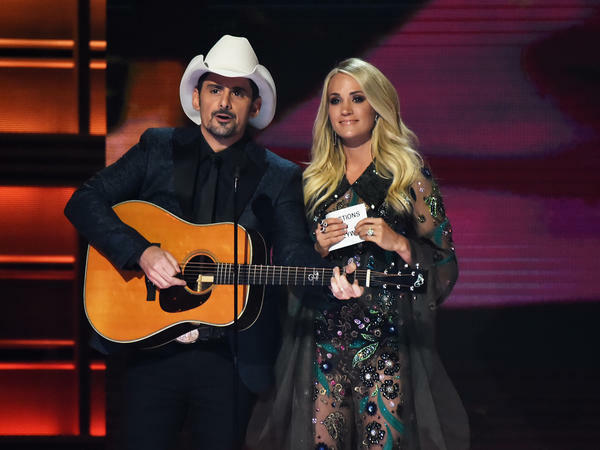 The Country Music Association Awards ceremony was Wednesday night, and people are still talking about the show because of what wasn't said that night. UNDERWOOD: ...Be doing any of our silly little songs because this year's show is a politics-free zone. PAISLEY: Are you kidding me? PAISLEY: That's not fair. Hold on. So we can't even do, like, (singing) well, way down yonder on the Scaramucci? That doesn't work? UNDERWOOD: No, no. No Scaramucci, Brad, no. MCEVERS: That was Carrie Underwood and Brad Paisley, who co-hosted the CMAs. And they weren't the only ones who were given guidelines. A week before the awards ceremony, the Country Music Association sent out media guidelines telling reporters not to focus on gun rights, political affiliations or the Las Vegas tragedy. That of course was the shooting where 58 people were killed, and it happened at a huge country music festival. Brad Paisley and others spoke out against the restrictions, and then those restrictions were reversed. But it brought into focus the relationship of the country music industry and the debate about guns in the U.S.
Music journalist Jonathan Bernstein has written about this, and he's with us now. Welcome to the show. JONATHAN BERNSTEIN: Thanks for having me. MCEVERS: I mean, what do you think the Country Music Association was worried about? BERNSTEIN: I think the Country Music Association was very worried that politics or what they view as politics or sort of debates about guns, about the NRA, about sort of what happened in Las Vegas would take the center stage on sort of what is generally considered to be the most important night of country music. MCEVERS: ...Gallup poll from several years back - 2004 - that showed more than 60 percent of country music fans are conservative. What about the artists themselves? What are their political affiliations? BERNSTEIN: You know, while they're certainly - there are mainstream country stars who are deeply conservative, and there are mainstream country stars who fall much more closely in line with liberal and progressive ideas. I think for the most part, you find with big entertainers at this point in country music, that the situation feels as though, you know, if you make one sort of strong statement in one way or the other, really you're risking alienating just a really large portion of your fan base. MCEVERS: Right. One thinks of the Dixie Chicks - right? - coming out against George Bush and the Iraq War. BERNSTEIN: Absolutely. If you talk to people in the country music industry about, you know, any topic relating to the intersection between politics and country music, the first name that you'll hear is the Dixie Chicks. MCEVERS: Billboard had a piece yesterday. It was a profile of Tim McGraw and Faith Hill. They have a new album. In this piece, they say they are in favor of gun control. Were you surprised by that - that they spoke out so clearly on an issue like that? BERNSTEIN: I would imagine there are these sort of whisper networks in country music of sort of who are the secret progressive, and who are the secret Democrats and liberals. And Tim McGraw and Faith Hill haven't been super secretive about their politics in the past. They donated money to Hillary Clinton's campaign, and they - and even on the issue of gun control, Tim McGraw - a couple of years ago, he had agreed to play a little - a benefit concert after the Sandy Hook shooting with this organization that was associated with gun control. And he received a lot of blowback from that. Tim McGraw and Faith Hill are two of the most successful and most-beloved country entertainers of the past 20 years, and they have, you know, a whole lot of money and a whole lot of fans that are devoted to them at this point. So I think that it's - it is easier for them to do it than, say, someone who's to any degree less proven, which is almost everybody in country music. BERNSTEIN: I don't expect there to suddenly be sort of some huge wave of country artists that are, you know, coming out and getting really involved. But I think that people are continuing to, at the very least, have this conversation with themselves. And I think that it's going to continue to be an issue on the minds of everybody in the industry for a long time. MCEVERS: Music journalist Jonathan Bernstein, thank you so much. BERNSTEIN: Thanks for having me. Transcript provided by NPR, Copyright NPR.